Obverse: Rust pits, flaws, and die crack. Although few of the references mention it, this issue always shows patches of roughness on the obverse, apparently created from die rust. One patch is on the top of the Indian's neck, just below the juncture with the hair. Another shows to the left of the longest feather about midway down, in the hair. Other patches are just above the obverse rim at 6 o'clock, and on the front of the neck, beneath the jawline. A small die crack runs southeast through this patch, with a small, comma-shaped lump near its lowest point. Reverse: Beard, hoof and leg, die lumps, spindly rear leg. 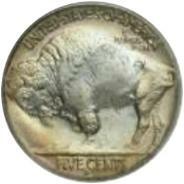 The reverse of a genuine 1937-D Three-Legged Buffalo also has numerous diagnostics that are easy to spot. The buffalo's beard is pointed, and longer on the right (facing) side than the left. Although a Mint employee removed the front leg with an emery board, the hoof is still present. There is a stream of raised die lumps running downward between the front and rear legs. 1. The coins' outstanding feature is the buffalo's missing front leg. Both stump and hoof remain, but the leg is entirely gone! There should be no scratches or file marks in the area of the missing leg. 2. Also, there will be a raised line of "bumps" arching from the Bison's belly to the ground. 3. Lastly look at the "P" in the word Pluribus and the "U" in the word Unum found on the left side of the buffalo. On a genuine "three leg," they will be further away from the buffalo's back than on a normal 1937D. Notes: 1937-D "Three Legged Variety"
It is rare when an error in U.S. coinage can be traced to the individual who was responsible for creating that error. In 1937, a Mr. Young, who was then new to the Mint, and under pressure to complete a quota of coinage, took an emery stick and ground off evidence of die clashing from a pair of dies. But, in his haste, he also inadvertently ground off part of the foreleg of the bison. Only one pair of dies was so affected and Mint State examples are very scarce, although lower grade, circulated coins are always available for a price. These nickels are known as Buffalo, Bison or Indian Head nickels. 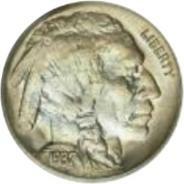 James E. Fraser designed this nickel employing three different Indians as models. His initial "F" is beneath the date. The bison was modeled after "Black Diamond" in the New York Central Park Zoo.